The Mario & Luigi games have been around for quite awhile now on Nintendo's handhelds, and if you've played them before, you pretty much know what to expect: goofy story lines, great music and solid RPG gameplay. When Bowser's Inside Story came out, it was no exception, but here we are, almost 10 years later and we've actually got a remake with Mario & Luigi: Bowser's Inside Story + Bowser Jr's Journey. Ten years is undoubtedly a lot of time, so let's get into what you can expect out of this title and the improvements it has made along the way! Bowser's Inside Story starts out by introducing you to a disease going around the Mushroom Kingdom: the Blorbs. It‘s making citizens balloon up to 1,000 times their size, rendering the mushroom people immobile. Mario and Luigi attend an emergency meeting at Peach's Castle, only for it to be crashed by Bowser. Go figure, right? After being trounced by Mario, Bowser is tricked (by a reoccurring villain Fawful) into eating a Vacuum Shroom and ends up inhaling several key residents of Mushroom Kingdom, including Peach and the Mario Brothers. This paves the way for Fawful to take over the kingdom and leave the Mario Brothers shrunk down inside Bowser's insides. Lovely! 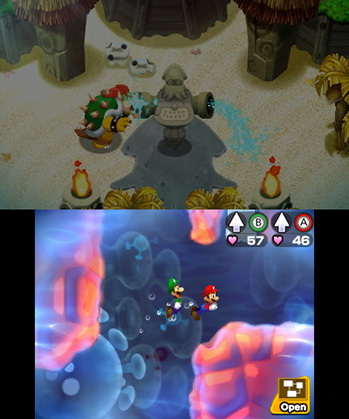 From here, Mario and Luigi will have to navigate Bowser's insides while searching for the princess and trying to find a way to stop Fawful's schemes. In the meantime, Bowser is also trying to figure out what's going on as Fawful goes after his castle and minions as well. Being the third game in the series, Inside Story is full of Mario RPG charm. The entire story is chock-full of humor, and the story legitimately made me laugh out loud more than once (which is fantastic, as I'm so very jaded). Mario and Luigi themselves don't really talk, of course, so the majority of the humor comes from NPCs and your interactions with them. The icing on the cake, though, is Bowser and his story, as you actually get to play as the koopa king throughout the game (and boy does he talk!). All in all, the story is fairly standard in its scope (stop the bad guy, save the kingdom, you know the drill), but the writing and humor are top-notch and make it worth playing! If you've played any of the Mario RPG games, you will be right at home here. Mario and Luigi will both get into turn-based battles, but of course, instead of swords and magic, they will use their jumping and hammers to defeat their foes, gaining experience and leveling up (you even get to give yourself bonus stats, which is a nice touch). Unlike most RPG titles, though, attacking and defending are an active process, as you need to time your button presses on offense and defense, which keeps you in the game at all times (which is impressive) and helps you deal more damage and take less damage with good timing. As you play, you will level up and discover (or purchase) new armor and items at a steady pace. Many of them are more than just stat-boosters as well, as they often give you special abilities that can straight-up change how you play (such as armor that gives you more SP when you use armor attacks). What’s even more impressive, though, is the sheer variety of enemies in battle. Not only is there a lot of them, but every single one has some unique way that they attack you. That sounds weird, I know, but that’s a fantastic detail as you have to constantly learn new attack patterns during battles. When I said the gameplay is an active process, I meant a REALLY active process! Still, the one word that describes the gameplay system here is just FUN. You are constantly fighting new enemies or required to do some new mini-game. As the game goes on, you get newer and more complicated special attacks with both Bowser and the Mario Brothers, and you eventually get a badge system that rewards you with special bonuses during battle. The whole game is just interactive fun at its finest, combined with a ton of variety that guarantees you never get bored, and that’s what really makes it special. One of the biggest changes in the remake, bar-none, is undoubtedly the graphics (which you would expect from a remake). Still, this is a complete overhaul. They say a picture is worth a thousand words, but if you're curious as to how big a change this game made graphically, there are some comparison videos out there that showcase the two games side-by-side. We've basically gone from a (fantastic looking) 2D game to a (fantastic looking) 3D game here, and the improvements are obvious. The developers really went out of their way on the remake, with new animations and even new scenes entirely, which really help make the game not only humorous but memorable as well. Color me impressed! Overall, the graphics are pretty much a perfect upgrade. Remasters can be a tricky thing, especially with such a long between releases, but it’s pretty clear AlphaDream didn’t lose a beat with the title as it looks fantastic. Being a 3DS game, I should also note that the game makes heavy use of the bottom touch screen. They are used for certain attacks during battle (mainly for the special attacks for Bowser and the Brothers), but as mentioned before, Bowser’s Inside Story has so much variety that you can come across a mini-game at any time that may need you to use the touch screen as well. So far my impressions of the game has been pretty positive, and the audio doesn’t disappoint either. The soundtrack matches the presentation flawlessly, with whimsical tracks accompanying the often goofy antics happening on-screen. After so many games, they’ve really nailed down that Mario sound, as the music is not only quirky but often straight-up memorable as well (seriously, go check out “Bumpsy Plains DX” on YouTube if you want an example… it’s so good!). The sound effects are also perfect, from the voices to the battles. Just an awesome job with the audio all around! Another one of the big selling points is the extra game mode: Bowser Jr’s Journey. First, I should note that you can play it right from the get-go, as you choose between the main game and Bowser Jr’s Journey at the main menu (which is nice). The new mode features Bowser Jr as he tries to solve the Blorb issue on his own (to impress his dad). As you may expect, it’s a fun addition to the main game, with entirely new gameplay mechanics, as Bowser Jr recruits an army (think Goombas, Koopas and various other Mario staple enemies) and fights squad battles. They mostly play out on their own, but there are times when you’ll need to be active. The best part for me was seeing the other Koopa Kids (Ludwig, Roy, Morton) in the story (and battles) here as well. The main campaign alone is around 25-30 hours of entertainment, but the fact that Alphadream went out of their way to add the extra mode - as well as the sheer amount of work they did on overhauling the title - really does give the game a lot of value. We shouldn’t be too surprised, though, as they did the same thing for Superstar Saga. In the end, if you enjoy quirky RPG’s, Mario & Luigi: Bowser's Inside Story + Bowser Jr's Journey should definitely be on your radar. The story is funny, the battle system is fun and engaging and just every part of the game is solid. I’m thoroughly convinced that any RPG fan would enjoy Bowser’s Inside Story and this remake is the way to do it! The core story and gameplay haven’t changed much from the original GameCube title. The plot follows Luigi, who wins a mansion from a contest that he never entered. If that isn’t suspicious enough, Mario has gone missing, so it’s up to Luigi to investigate this mysterious mansion, a home to a gaggle of ghosts. Reviews, Playstation 4Gregory Wright December 31, 2018 remaster, PlayStation 4, playstation remaster, rpg, RPG elements, JRPG, PS4 Strategy, Strategy, Square Enix, great soundtrack. In the end (as you can probably tell), The Last Remnant isn't really my cup of tea. I just can't get into the story here and the gameplay isn't exciting enough to hold my interest. I blame the dull characters and the repetitive hands-off approach to the battle system. Dream Team's bright and friendly world is an easy one to fall in love with, but by the time you reach the end, that love will have been tested repeatedly by uneven design and a lack of narrative follow-through. Many of its flaws could be reduced to its strict following of the series' formula without expanding on what makes it endearing. Much like Luigi's dreams, AlphaDream's latest is a little pre-occupied with expectations of Big Bro. As enjoyable as the presentation and more puzzle-oriented aspects were, the team at Intelligent Systems needs to ensure that they don’t lose sight of what made this series so special in the first place.